Cancer Research UK champion Ada Haywood is presented with a British Empire Medal. Cancer Research UK champion Ada Haywood has been presented with a British Empire Medal. 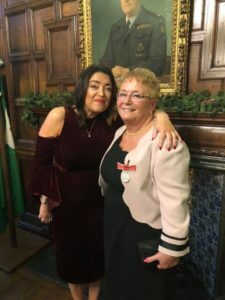 Ada, who has raised more than £1m for the cancer charity, was guest of honour at a special ceremony hosted by the Lord Lieutenant of Staffordshire Ian Dudson, at County Buildings, Stafford. Many cancer survivors have reasons to be thankful for the incredible efforts of Clayton grandmother Ada. 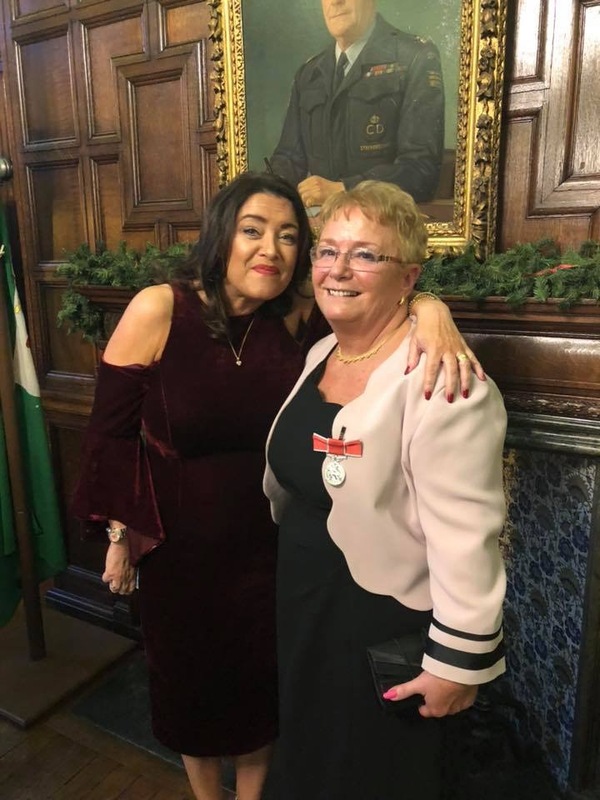 She organises an annual fundraising ball in North Staffordshire, hosts Motown Nights and has even ridden the world’s longest zip-wire in 27 years supporting Cancer Research UK. Her inspirational efforts were recognised by the Queen when she was awarded a British Empire Medal in Her Majesty’s 2017 Birthday Honours. Ada took on the challenge as Cancer Research UK’s North Staffordshire fundraiser in 1992 alongside her husband Peter and has won the support of the area’s business community. Her tireless efforts include regularly getting up before dawn to raise awareness about her chosen charity at business networking meetings. Peter and Ada even have a room named after them at the Cancer Research UK headquarters and even Peter’s death, from a rare cancer in 2016, hasn’t stopped Ada as her 2018 annual ball raised almost £50,000. “It was a major honour to meet the Lord Lieutenant and to be presented with my BEM surrounded by my family,” said Ada. “I will keep on fighting as cancer continues to affect one in two people and we need to find a solution. “I am hosting a Motown evening at the Moat House, Festival Park, this Spring and my Pink Tie Ball at the same venue this autumn has already sold out. This award is for Peter, my family and also for all the local people who support me. Martin Graham is the Managing Director of Pegasus Fire and Security, a company he set up in 2015 after leaving the military. The married father of two from Blythe Bridge served in the Parachute Regiment and joined BNI shortly after setting up his business. He said: “BNI has been absolutely fantastic for me and Pegasus. It’s not just the business referrals you get, it’s the contacts you make around the table and the relationships you build." “The training and mentoring opportunities you have access to by becoming a member are great. There are people in my chapter that have been in business longer than I’ve been alive so the advice, guidance and experience they bring to the group is second to none and benefits every single member." Martin added: “In the last twelve months I’ve had 50 referrals through BNI – that’s 50 business opportunities generating £190,000 of invoiced business. Business and revenue I wouldn’t have had without being a member. Some of the biggest contracts we’ve had have come through direct BNI referrals and these are national contracts with extremely well-known franchises. The figures really do speak for themselves and I’d recommend BNI to any company who wants to grow their business and take it to the next level,” Martin explained. Matthew Dashper-Hughes is the owner of Office Prime Supplies, a company he set up last year. He has 20 years’ business experience, including a role as the Chief Operating Officer at Ryman, part of the Theo Paphitis Retail Group. Matthew joined BNI in November 2017, just a few months after setting up his business. He said: “When I first set up Office Prime Supplies I was used to working for companies with well-established brands, so I underestimated how much having a big brand can attract customers. As a new business I didn’t yet have a reputation, so in the early days it’s fair to say that my sales forecasts were overly optimistic." Matthew added: “It meant I needed to rethink my marketing strategy to attract more business. I needed a way to establish a good reputation. Luckily an associate suggested BNI. I can honestly say joining was the best thing I could have done for the company and for myself. I totally clicked with it straight away. Within 12 weeks my membership had paid for itself! You get out what you put in - it takes time and commitment to build your reputation. Once people get to know you for reliability, consistency and delivery you get that all-important trust. As I’ve gained more credibility around the table, the level of return has continually grown; I’m generating more and more business and revenue." “I’ve met some fantastic individuals with great companies through BNI, and I’ve built solid business relationships with people I can now work with to generate sales and to deliver supply chain solutions; exploring synergies that benefit both our businesses and our customers. Before, when I worked for big companies I was used to hitting speed-dial to speak to colleagues and staff to get things done, now I’m a solo owner-operator I’m responsible for everything within my business. Being a member of BNI is a tremendous help because it gives me access to a huge team of trusted colleagues; people with different skill-sets to support me and my company,” he explained. Lesley Knight is a Fundraising Executive with the County Air Ambulance Trust HELP Appeal. Her son Thomas was tragically killed in 2008, aged just 11-years-old. He was airlifted to Birmingham’s Children’s Hospital where he sadly died. Following Thomas’ death, Lesley quit her job as a hairdresser and started fund-raising for the Air Ambulance’s Help Appeal. She joined BNI in 2011 and has since raised a staggering £600,000 for the charity. Lesley said: “When I joined BNI I wasn’t a business person, I couldn’t even turn a computer on and was a totally different person than I had been before I lost Thomas. I had no confidence and used to visibly shake when I had to stand up and deliver presentations in front of people. “I can’t tell you how amazing the BNI members were. Everybody knew what I had been through and accepted me. They embraced me and every individual around the table helped and supported me, which was amazing. Over time the support from BNI members and attending the training sessions meant my confidence and my social skills developed. I started to become far more business minded and became unconsciously confident - to the point that for the first charity ball I organised I was able to publicly speak in front of 300 people, something I could never have done when I first joined. She explained: “Being part of the group and fundraising gave me a reason to live again. The people in the room were encouraging and helped me believe that I could organise big fund-raising events and supported me at them too. At the first ball I did, I had three tables of BNI members there all supporting me as an individual as well as the charity. Members in my group have all shown such kindness by raising funds by doing things like running marathons, hosting events or doing sponsored cycle rides, which is humbling for me to see. Tamsin Parker is the Managing Director of Legs PR Agency, a Staffordshire based PR and Communications company. The Staffordshire Moorlands Mum is also a working journalist and journalism lecturer at Staffordshire University. She joined BNI shortly after she set up her business in 2017. “Joining BNI is the best thing I could have done for me and my company. When I set up Legs PR, I naively thought that I’d get the website launched and all my social media accounts and work would just come in to me. Obviously with a new company that’s not the case at all as you have to go out there and work to get new business.” Tamsin said. “A huge percentage of my PR works comes through BNI. Within two months of joining, the revenue I’d received had covered my membership fees for the whole year. I’ve not even been a member for a full 12 months yet and I’ve already had more than 40 referrals, which are opportunities I would never had been given access to if I hadn’t been a member. A Newcastle-under-Lyme lettings agent has been crowned as the best in town after coming out on top in a series of mystery caller challenges. Applied Lets scooped a Gold medal in the British Property Awards following an independent assessment of the town’s agents and will now go through to the national finals. Run by Sharon Wheatley, an experienced property professional, Applied Lets has offices in West Street, Newcastle. Sharon said: “We pride ourselves on the high standards of service we give to landlords and tenants and it is fantastic to get this independent accolade, confirming our quality standards. We have two members of staff, Lee Wallace and our apprentice Charlotte Meredith and this award is recognition of how dedicated they are in the way they work with our customers, both landlords and their tenants. The British Property Awards say: “We consider a broad spectrum of criteria during the judging process, criteria which often goes unseen by clients, taking a purposeful step away from the traditional model of merely relying on client reviews from successful sales. In total, we judge agencies against a set of 25 criteria, with each criteria being weighted differently. We believe that we provide the most comprehensive awards in the sector. To find out more about Applied Lets please go online to www.appliedlets.co.uk.